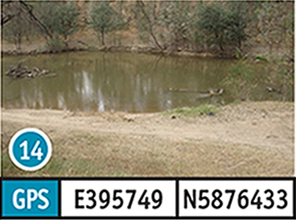 Waranga Caravan Park: The road to, and parking at this site, is good and can be accessed in a 2WD vehicle in any weather conditions. The bank slope is flat and the access to the water is good. Camping, toilet, picnic tables and fireplace/BBQ facilities are all available at the site. 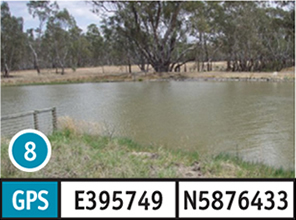 This site is located 43km south of Shepparton along the Goulburn Valley Highway. Then you will need to take the Bendigo-Murchison Road for 8km, then the Channel Inlet Road for 6km. There are also three other access points available in this area, these are, Waranga Outlet Channel, Waranga Inlet and Harrimans Point. Majors Creek: The road to, and parking at this site, should only be accessed in a 2WD vehicle in dry weather conditions. There is a dirt boat ramp at this site which should only be attempted in a 2WD vehicle in dry conditions. The bank slope is flat and the access to the water is good. Camping, toilets and picnic tables are all available at the site. 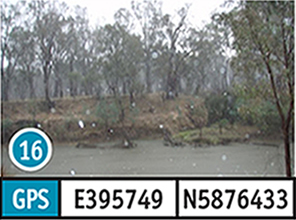 The turn off to this site is located 69km south of Shepparton, along the Goulburn Valley Highway. Take the Mitchelltown Road for 7km and an unnamed road for 1km. Michelltown Bridge: The road to, and parking at this site, can be done in a 2WD vehicle in any weather conditions. The bank slope at this site is moderate and the access to the water is also moderate. There is a dirt boat ramp available that should only be attempted in a 2WD vehicle in dry weather conditions. There are no facilities available at this site. 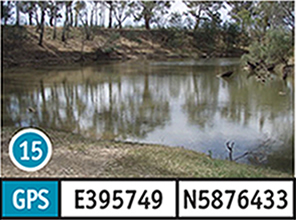 The turn off to this site is located 69km south of Shepparton along the Goulburn Valley Highway. Then take the Mitchelltown Road for 4km. 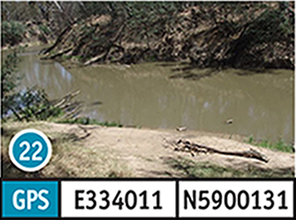 Chinamen’s Bridge: The road to this site can be accessed in a 2WD vehicle in any condition, the access and parking at this site should only be attempted in a 2WD vehicle in dry weather conditions. There is a dirt boat ramp available that should only be attempted in a 2WD vehicle in dry weather conditions. The bank slope is flat and the access to the water is moderate. There are no facilities available at this site. The turn off is located 58km from Shepparton along the Goulburn Valley Highway. Then take Vickers Road for 3km followed by Mullers Road for 200m. Picnic Point: The road to this site can be accessed in a 2WD vehicle in any condition. Access and parking at this site should only be attempted in a 2WD vehicle in dry weather conditions. There is a gravel boat ramp at this site that can be attempted by a 2WD vehicle in any weather condition. The bank slope is flat and the access to the water is good. There are no facilities available at this site. 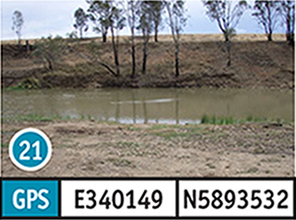 The turn off to this site is located 50km south of Shepparton Goulburn Valley Highway. Then take the Kirwans Bridge-Longwood Road for 3km, followed by an unnamed road. 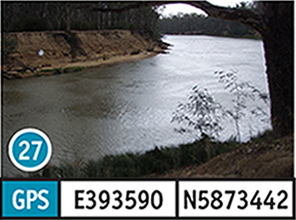 Goulburn Weir: The road to, and parking at this site, can be accessed in a 2WD vehicle in any weather condition. The bank slope is moderate and the access to the water is also moderate. Toilets, picnic tables and fireplace/BBQ facilities are all available at the site. 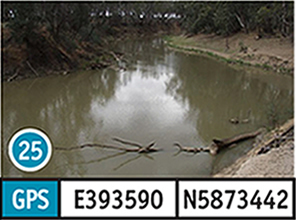 The turn off to this site is located 27.3km south of Shepparton along the Goulburn Valley Highway. Take the Murchison-Violet Town Road 8.8km, followed by the Murchison- Goulburn Weir Road for 13.1km. Campbell’s Bend: The road to, and the parking at this site, can be accessed in a 2WD vehicle in any weather condition. There is a dirt boat ramp available that should only be attempted in a 2WD vehicle in dry weather conditions. The bank slope is flat and the access to the water is good. Toilets and picnic facilities are available at the site. 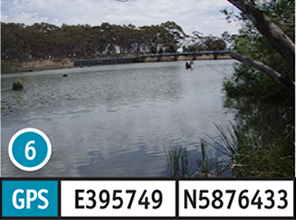 The turn off to this site is located 27.3km south of Shepparton along the Goulburn Valley Highway. Then take the Murchison-Violet Town Road for 7.5km, followed by Campbells Bend Road for 800m. Stuart Murray Channel: The road to, and parking at this site, can be accessed in a 2WD vehicle in any weather condition. The bank slope is flat and the access to the water is good. There are no facilities available at this site. 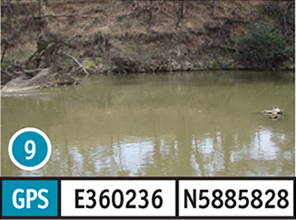 The turn off to this site is located 27.3km south of Shepparton along the Goulburn Valley Highway. Then take the Bendigo-Murchison Road for 3km, followed by the Murchison-Violet Town Road for 9km. 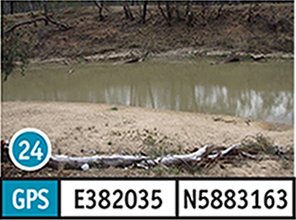 Murchison East: The road to, and parking at this site, can be accessed in a 2WD vehicle only in dry weather conditions. The bank slope is moderate and the access to the water is also moderate. There is camping allowed at this site, but there are no facilities available. 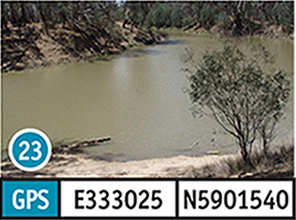 The turn off to this site is located 27.3km south of Shepparton along the Goulburn Valley Highway. Take the Murchison-Violet Town Road for 5km and then take Cassidys Road for 2.3km. Cemetery Bend: The road to, and parking at this site, should only be attempted in a 2WD vehicle in dry weather conditions. The bank slope is moderate and the access to the water is also moderate. Camping is available at this site and facilities include toilets, picnic tables and fireplace/BBQ. 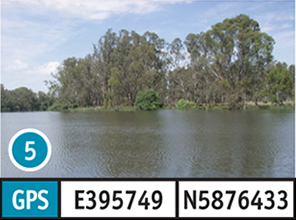 The turn off to this site is located in 4.2km south-west of Shepparton along the Midland Highway. Then take Toolamba Road for 14km, followed by Wattle Track for 850m and Booarang Track 800m. Toolamba Rail Bridge: The road to this site can be done in a 2WD vehicle in any weather condition. Access and parking at this site should only be attempted in a 2WD vehicle in dry weather conditions. The bank slope is moderate and the access to the water is also moderate. There is camping available at this site. 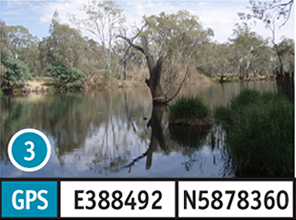 The turn off to this site is located 4.4km south-west of Shepparton along the Midland Highway. Then take the Mooroopna-Murchison Road for 12.3km, followed by Bitcon Road for 1.7km and Rutherford Road for 1km. 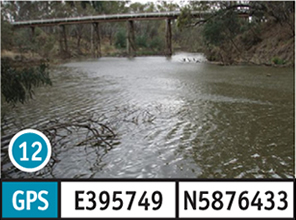 Toolamba Bridge: The road to this site can be attempted in 2WD vehicle in any weather condition. Access and parking at this site should only be attempted in a 2WD vehicle in dry weather conditions. The bank slope is steep and the access to the water is poor. There are no facilities available at this site. 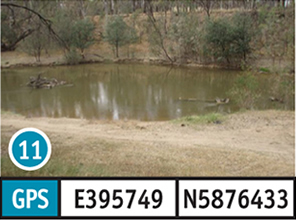 The turn off to this site is located 13km south of Shepparton along the Goulburn Valley Highway. Then take Union Road for 1.4km, followed by Newmans Road for 120m and Bridge Road for 500m. Jolly’s Bend: The road to, and parking at this site, can be attempted in a 2WD vehicle in any weather conditions. The bank slope is steep and the access to the water is moderate. There is camping available at this site. 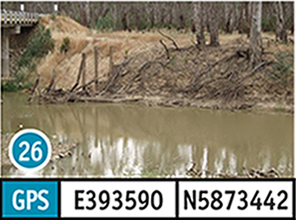 The turn off to this site is located 10.7km south of Shepparton along the Goulburn Valley Highway. Then take Nadzab Track for 2km. 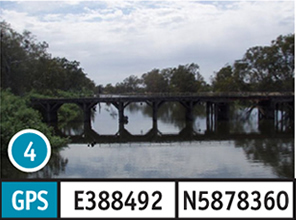 Mooroopna Bridge: The road to, and parking at this site, can be accessed in a 2WD vehicle in all weather conditions. There is a dirt boat ramp that can be accessed in a 2WD vehicle in any weather condition. The bank slope is flat and the access to the water in moderate also. There are no facilities available at this site. 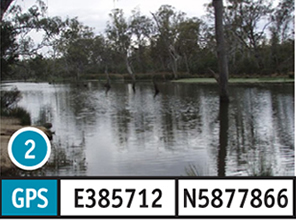 The turn off to this site is located 4km west of Shepparton along the Midland Highway. Then take Watt Road for 150m. 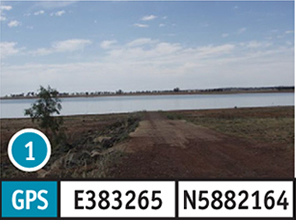 Pykes Road: The road to, and parking at this site, can be accessed in a 2WD vehicle only in dry weather conditions. 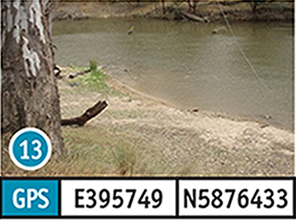 There is a gravel boat ramp that should only be accessed in a 2WD vehicle in dry weather conditions. The bank slope is steep and the access to the water is moderate. Camping is available at this site, but there are no facilities. The turnoff to this site is located 5km south-west of Shepparton along the Midland Highway. Then take the Mooroopna-Murchison road for 4km, followed by Pykes Road for 1.2km and Mahoney track for 700m. There are also another two sites available in this area, these are, Rafferty’s Bend and Darcy’s Bend. 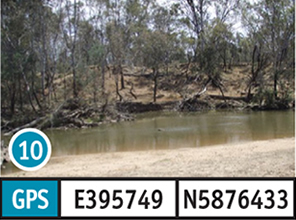 McCrackens Bend: The road to, and parking at this site, can be accessed in a 2WD vehicle only in dry weather conditions. The bank slope is steep and the access to the water is hard. Camping is available, but there are no facilities available. The turnoff to this site is located 5km north of Shepparton along the Goulburn Valley Highway. Then take the Barmah-Shepparton Road for 4km, followed by McCracken Road for 1.5km and McCracken Track for 1.6km. The access point (or parking) is located a further 3km from the turnoff. GPS There is another site available in this area it is Cooma Bend. Loch Garry: The road to, and parking at this site, can be accessed in a 2WD vehicle only in dry weather conditions. The bank slope is moderate and the access to the water is good. There is camping available, but there are no facilities available. The turnoff to this site is located 5km north of Shepparton along the Goulburn Valley Highway. 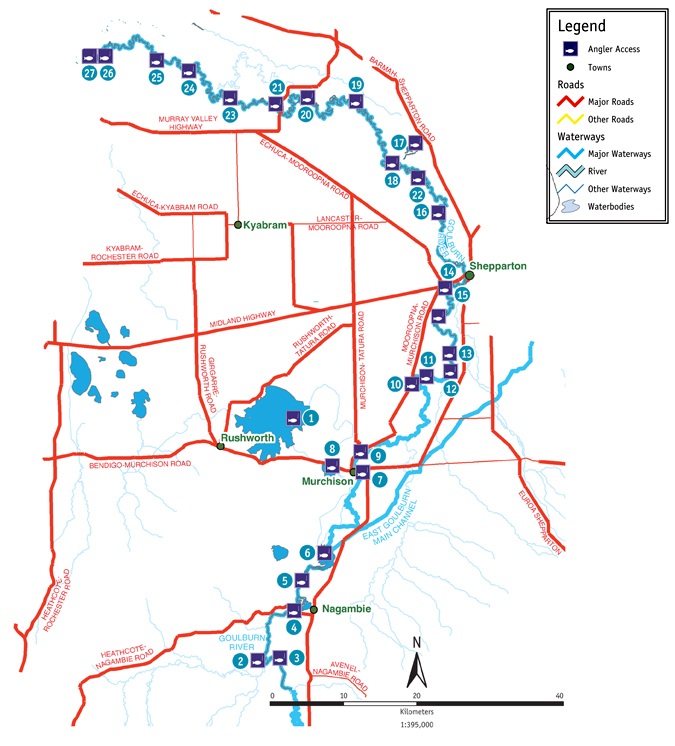 Then take Barmah-Shepparton Road for 14km, and Loch Garry Road for 2.0km. Hurricane Bend: The road to, and parking at this site, can be accessed in a 2WD vehicle only in dry weather conditions. There is a gravel boat ramp that should only be attempted in a 2WD vehicle in dry weather conditions. The bank slope is steep and the access to the water is hard. There is camping available, but there are no facilities available. The turnoff to this site is located 5km north of Shepparton along the Goulburn Valley Highway. Then take Barmah-Shepparton Road for 14km, then Loch Garry Road for 4.0km and an unnamed road for 3km. There is another site available in this area which is Myers Bend. Breens: The road to, and parking at this site, can be accessed in a 2WD vehicle only in dry weather conditions. The bank slope is steep and the access to the water is poor. There is camping available, but there are no facilities available. The turnoff to this site is located 5km north-west of Shepparton along the Goulburn Valley Highway. Then take Barmah-Shepparton Road for 34km, followed by Murray Valley Highway for 7km, then Rathbones Road for 6km and an unnamed road for 800m. 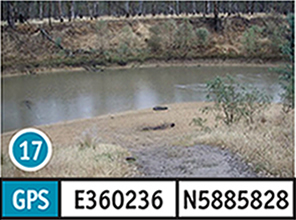 Frasers: The road to, and parking at this site, can be accessed in a 2WD vehicle only in dry weather conditions. The bank slope is steep and the access to the water is poor. There is camping available, but there are no facilities available. The turnoff to this site is located 5km north-west of Shepparton along the Goulburn Valley Highway. Then take Barmah-Shepparton Road for 34km, followed by Murray Valley Highway for 8km, then Frasers Road for 2km. Mc Coys: The road to, and parking at this site, can be accessed in a 2WD vehicle only in dry weather conditions. The bank slope is moderate and the access to the water is moderate. There is camping available, but there are no facilities available. The turnoff to this site is located 5km north-west of Shepparton along the Goulburn Valley Highway. Then take Barmah-Shepparton Road for 34km, followed by Murray Valley Highway for 14km, and Vearings Lane for 800m. 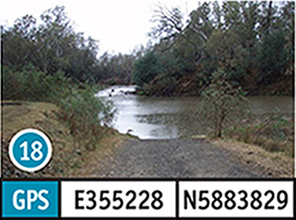 Thompson’s Bend: The road to, and parking at this site, can be accessed in a 2WD vehicle only in dry weather conditions. The bank slope is steep and the access to the water is moderate. There is camping available, but there are no facilities available. The turnoff to this site is located 4km north-west of Shepparton along the Midland Highway. Then take the Echuca-Mooroopna Road for 6km, followed by Alexandra Road for 5km, Koenig Road for 1km and Thompsons Track for 6km. There is another site available in this area which is called Modland Road. Emily Jane Rd: The road to, and parking at this site, can be accessed in a 2WD vehicle only in dry weather conditions. The bank slope is steep and the access to the water is poor. There is camping available, but there are no facilities available. The turnoff to this site is located 4km north-west of Shepparton along the Midland Highway. Then take the Echuca-Mooroopna Road for 34km, followed by the Murray Valley Highway for 3.5km, and Emily Jane Road for 4.5km. 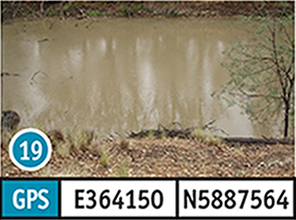 Yambuna: The road to, and parking at this site, can be accessed in a 2WD vehicle only in dry weather conditions. The bank slope is steep and the access to the water is poor. There is camping available, but there are no facilities available. The turnoff to this site is located 4km north-west of Shepparton along the Midland Highway. Then take the Echuca-Mooroopna Road for 34km, followed by the Murray Valley Highway for 9km, and Curr Road for 8km. 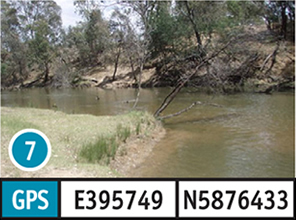 There are another two sites available in this area, these are, Yambuna Bridge and Black gate. Watson Road: The road to, and parking at this site, can be accessed in a 2WD vehicle only in dry weather conditions. The bank slope is steep and the access to the water is poor. There is camping available, but there are no facilities available. The turnoff to this site is located 4km north-west of Shepparton along the Midland Highway. Then take the Echuca-Mooroopna Road for 34km, followed by the Murray Valley Highway for 13km, and Watson Road for 10km. Stewarts Bridge: The road to this site can be completed in a 2WD vehicle in any weather condition. The access and parking to this site can only be done in a 2WD vehicle in dry weather conditions. The bank slope is steep and the access to the water is poor. There is camping available, but there are no facilities available. The turnoff to this site is located 4km north-west of Shepparton along the Midland Highway. Then take Echuca-Mooroopna Road for 34.4km, followed by Murray Valley Highway for 20km, then McDonald Road for 8km, Bangerang for 700m and Stewarts Bridge Road for 600m. 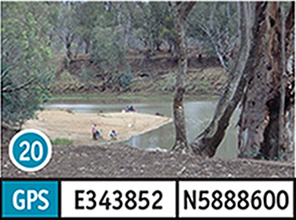 Junction of Goulburn and Murray rivers: The road to, and parking at this site, can be accessed in a 2WD vehicle only in dry weather conditions. The bank slope is steep and the access to the water is poor. There is camping available, but there are no facilities available. The turnoff to this site is located 4km north-west of Shepparton along the Midland Highway. Then take Echuca-Mooroopna Road for 34.4km, followed by Murray Valley Highway for 22.9km, followed by Looker Road for 9km.